OXFORD, Miss. – Austin Powell has long dreamed of winning a Rhodes Scholarship. Now, the University of Mississippi senior is just one step away from achieving that goal. 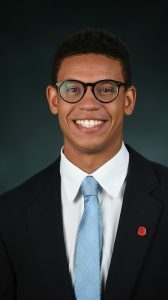 The Corinth native goes to Birmingham, Alabama, this weekend to interview as a Rhodes finalist and will learn Saturday whether he is selected for one of the prestigious scholarships. A public policy and philosophy double major in the Sally McDonnell Barksdale Honors College and the Lott Leadership Institute, Powell said he was excited when he heard the news. “My ultimate goal is to come back and raise the quality of life for Mississippians by developing an in-depth understanding of the criminology and the criminal justice system, how different entities can become community partners in Mississippi, and how the state can take partial ownership of the solution,” said Powell, son of former state Sen. Eric Powell and Gwen Salters Powell. The Rhodes Scholarships, the oldest international fellowships, bring outstanding students from many countries to the University of Oxford in the United Kingdom. Besides “intellectual distinction,” the selection committee seeks excellence in qualities of mind and of person, which combined offer the promise of effective service to the world in the decades ahead. Rhodes Scholars are elected for two years of study at Oxford University, with the possibility of being renewed for a third year. Powell’s selection as a finalist is an honor for him and an important distinction for the university, said Douglass Sullivan-Gonzalez, Honors College dean. Powell has put together a long list of accomplishments during his four years at UM. He is Associated Student Body president, was assistant director for the Ole Miss Big Event, social chair for the Columns Society and co-philanthropy chair and tribune for Sigma Chi fraternity. Powell is also a member of Omicron Delta Kappa, a McLean Innovation Scholar, a Trent Lott Institute Scholar and a Coca-Cola Scholar. While teaching entrepreneurial and leadership development at the Marshall County Correctional Facility, Powell gained insights for the subject of his honors thesis, being directed by Jody Holland, UM assistant professor of public policy leadership. “I have not met another student who has impressed me as much as Austin has in combining creativity, hard work, initiative and courage,” Holland said. Associate Dean of Students Valeria Ross agreed. Powell begins a two-day interview process Friday (Nov. 18) before the District 7 selection committee. Finalists are chosen from each state to interview by district, and District 7 includes Mississippi, Alabama, Louisiana, Florida, Puerto Rico and the U.S. Virgin Islands. This process leads to the selection of 32 scholars nationally, from roughly 900 applications. To prepare for the interview, Powell said he has been reading The New York Times and listening to National Public Radio every day, researching correctional education and poverty studies, and mapping out answers to probable questions. UM’s last Rhodes Scholar was Shad White, selected in the 2008 competition. Powell has a healthy outlook about the interview process.